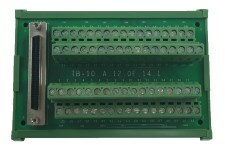 This I/O break-out board enables easy termination of the CENS110 cable's 68 conductors. Just mount it on a DIN rail and connect the cable. Suggested for use with the CRNS991 and CRNS992.